If you haven’t heard from me in a couple weeks, I want you to know there’s a pretty darn good reason. Although I took a day off to recover after our big Lead Pages and CRM launch in November, there really is no rest for the weary as we’re smashing through the rest of 2018 to get ready for 2019. (3) an update on what we’re working on for the guides, as you never did get the last part of the Subject To series that I’ve been working on. Have you ever wanted to perform a second analysis on a property reusing most of the data that you already entered for that property, but changing one major aspect of it such as the comps for example? I have, but I couldn’t bear the thought of re-entering all of the data that I already entered, let alone making you go through that pain. 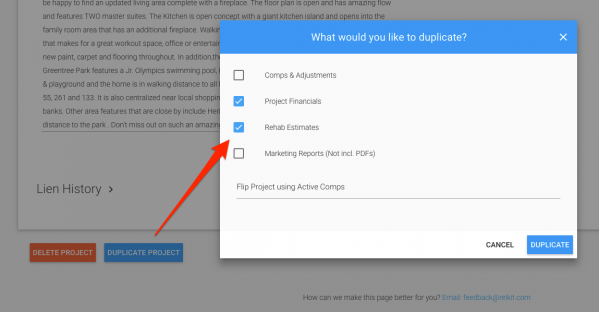 You can now duplicate a property project, including the ability to use (or not use) any of the data already entered into the original project. Say you wanted to show your motivated seller the value of their property As-Is using other As-Is comps. Or you wanted to use only active comps, to see where the market may be going. Or you wanted to use the same comps, but estimate a different level of rehab. This was quietly released right before the Lead Pages & CRM launch, and I’ve been using it to make sure that both you and I will get value out of it. I’m happy to report that it’s a pretty awesome addition and here to stay. I had no idea how awesome it was going to be until I got it in my hands on it. 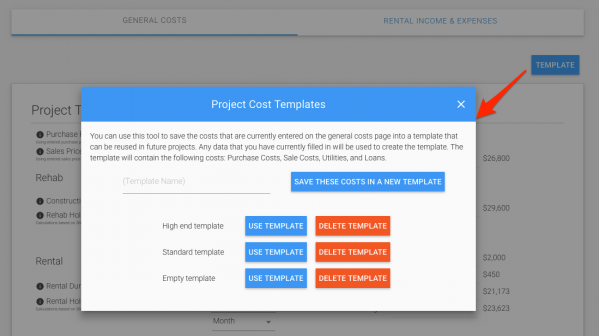 Not only is this a huge efficiency improvement in your project due diligence, it removes the potential for errors, especially if you’re relying on VAs to do some of the work. My only regret is not getting this in your hands sooner. There was a small update to the CRM with tasks having moved to their own tab with an improved interface for editing and completing them. So what’s next on the horizon? With just over 2 weeks left, I’m rushing to close out the year with a major data source upgrade that will give us additional data points on properties including whether they are absentee owned, and the mailing address for those owners. New information on this is coming in every day, so look for a more detailed update on that data source next week. Then kicking off early 2019 will be the addition of a website builder including the ability to have your own domain, so as to complete your online business profile for organic lead generation. Although it’s about 50% done, I’m going to put it down for a while, and replace it with something that is much more actionable to you right now. I’m replacing it with guides to help you become successful in using PPC (Pay Per Click) online advertising campaigns, and driving high intent traffic to your lead pages. Because without leads, there is no point in talking about acquiring a property Subject To. That’s it for this update. Please let me know if you’d like any more detail about how we’re planning to help you crush it in 2019. Expert Due Diligence + Expert Marketing = SCALE: Lead Marketing Pages and Seller Leads CRM Launching! The House Flipping & Wholesaling Game Has Changed: Loan History Data Launched!